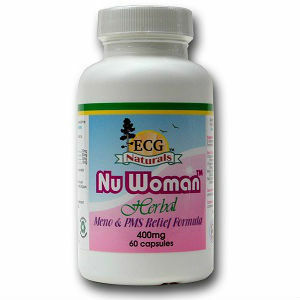 Nu Woman is a natural herbal formulation derived from herbs that have been proven to alleviate symptoms associated with PMS and menopause. Ingredients include Chaste Tree Berry powder extract standardized at 4:1 and Chaste Tree Berry powder, Black Cohosh Root and Red Clover Flower Tops. Specific ingredient amounts in milligrams was not provided in the product source. No information on daily dosage amounts could be found in the product source. $16.95 for a 60 capsule container. The product is available for purchase through the vendor’s website. The product source contained no information about guarantees or product return policies. It also contained no customer service contact phone number although it did provide an website tool to use to send questions by email to the vendor. Information was limited about this product in the product source (see the description notes above). Anyone considering buying this product should either contact the vendor (by email) or have a health service professional review the product prior to purchase. Jackie Horowitz	reviewed Nu Woman	on October 6th	 and gave it a rating of 2.